At long last, I have flowcharts! Now there is! Please feel free to download, email, post on your wall, send to friends or make paper airplanes out of this handy guide to changing a habit. Coming soon: a flowchart for creating a habit. I just finished the book and am going to try the flowchart to change a pesky habit. If it works, I’m going to try is at the hospital to improve our infection rate. I wish I could download a copy that I could just fill in (oh yeah, a lazy habit of mine). You want to IMPROVE your infection rate? Very useful and I thank you for giving us another tool. I love this book and it’s changed my thinking about so many things. Halfway through the book (audio version) and I have already made changes to my exercise regimen and spent more time with my son using the cue. routine, reward routine! And the info in the book is weel researched and disilled nicely in this flowchart.. a must for any motivated addict or procrastinator who feels an inner need to change!! I’d rename this the JUICE & COOKIES PLAN. It is a starting point. This diagram is like getting on an airplane and discovering the emergency instructions in the seat pocket consist of smiley faces. The charming self-deprecating cookie anecdote—like the “Aw Shucks” About the Author at the end of the book ignores your background and success. You are Harvard and Yale educated. You work for the Times. You were shortlisted for a Pulitzer. You are the 1% in which your life struggles consist of cookies and growing a full beard. 1. ATTACK ONE HABIT, A KEYSTONE HABIT. Exercise. Or Safety, in the case of Alcoa, which influence all other habits. 2. INFLECTION POINT. Better named Stress Point. Where the cycle is most likely to collapse and must be strengthened. 3. RECOVERY ROUTINE. It ignores the tools for recovery: Belief that change is feasible, which is bolstered by group membership. And the plan should begin not with CUE but with CRAVING (“craving powers the habit loop” 33). And finally, inexplicably, the annoying little circle diagram is there again. I think a better solution would have been to put the 1, 2, 3 in a circle, rather than, at this final stage, reducing it to a linear–and out of order–progression. And the circle should narrow at the Inflection Point, where arrows (Belief, Groups) reinforce the routine. you sound jealous that you didnt think of it first. Great flowchart! Makes it very easy to explain the basic ideas to friends who are interested in this stuff! Looking very much forward to your take on how to create habits! Will that flowchart be published anytime soon? 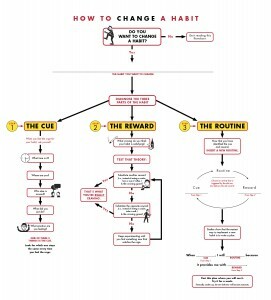 I have just started reading The Power of Habits, and am both fascinated and excited by the power of this concept. Thank you for the graphic! I got the tip of your book from the CNN Sunday morning show with Fareed Zakaria. Just started reading it. I interested in changing bad habits for myself and for those I supervise. Thanks for a very timely written book. I also like the flow chart. I’ll let you know how it comes along. The flowchart seems to have a cortically-mediated cognitive-behavioral leaning. Many habits containing a marked neuro-physiological component would need more than what is (at least overtly) expressed in the flowchart. This graphic in front of one’s face may help one to focus on positive changes. 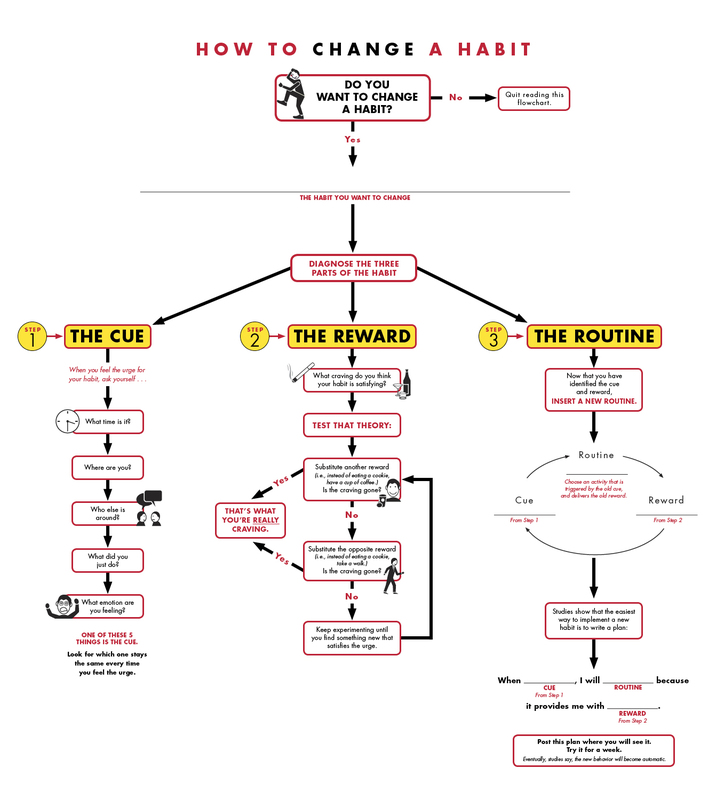 Looking forward to new graphic about creating new habits. Put them together and…one can hope it works. Consulting in stress relief and tai chi, I’ve seen how cravings, apathy, low self-esteem and stress disappear with a new activity. Doing anything other than our standard habit and not allowing time to lapse so that we get sucked into our regular behavior are key. Doing a movement activity works often because it produces a new set of chemical reactions which suppresses or lessens the “crave” hormones and may increase the pleasure neurotransmitters. The infographic portrays this simplicity. It is brilliant. I did not read The book, yet, but your e mail worked very well: I’m curious and interested on it. I live in Brazil and I couldn’t find it in the apple store as an e-book and I m looking the paper one. There must be some way to work this plan in reverse. I’m interested in developing some good habits in order to achieve a few goals. Anyone want to try to rework this diagram to help people form positive habits? I read the book over the summer, and scanned fifteen pages into a file for my personal use and then did a lecture for students in my Imagination Class, in the School of Entrepreneurship, Spears School of Business, Oklahoma State University. NASDAQ just posted us as the number one Entrepreneurship School in the US. May I put the pages in a reading, and publish that on our D2L site for students who have access, with proper citations and ways to view you, get your book? American Health Journal is looking for partners in the health care genre. AHJ is a medical website which owns three thousand of high quality medicine videos. We are seeking site owners who are interested in featuring our content. We can offer content exchanges, link exchanges, and exposure to your brand. Come contact us at our contact form on our site. American Health Journal is seeking partners in the medicine niche. AHJ is a medical web site containing a significant library of high quality medicine videos. We are looking for bloggers who are interested in writing guest blog articles to our website. . Come contact us at our contact page on our site. What a fabulous book! I thought it would be boring, but I couldn’t resist reading it….just in case it might work a miracle for me. Amazingly, it kept my avid interest and it contained not only interesting stories and background, but little miracles all the way through. Thank you!!! Amazing book and well done. I’m asking all the sales people I know to read it so they can better serve their clients. It’s also a great book for sales people to establish better habits. I look forward to your future flow charts. Nice infographic, but why the heck did you choose JPEG file format? JPEG is for photographs. For drawings you should favor PNG. In this particular case, I think it would make the most sense to make it available as a PDF. What program did you use to make this? Looks pretty good. First off I want to say fantastic blog! I had a quick question that I’d like to ask if you do not mind. I was curious to know how you center yourself and clear your thoughts before writing. I’ve had trouble clearing my thoughts in getting my ideas out.